Writing efficient user interfaces is the main maxim, here at Vimperator labs. We often follow the Vim way of doing things, but extend its principles when necessary. Towards this end, we’ve created the liberator library for Mozilla based applications, to encapsulate as many of these generic principles as possible, and liberate developers from the tedium of reinventing the wheel. Firefox 57 will change its add-on ecosystem to be exclusively based on WebExtensions. While this offers (some) compatibility with extensions written for Chrome and Microsoft Edge, it removes the possibility to do many advanced stuff which Vimperator does. Additionally, it would require a full rewrite of Vimperator, which nobody has volunteered for. Therefore we will stop supporting any Firefox version later than Firefox 56. Head over to our GitHub page for a list of alternatives or a detailed discussion. If you want to have famous last words, you can take a survey here to inspire future add-on authors what you actually liked about Vimperator (update: survey results in CSV). 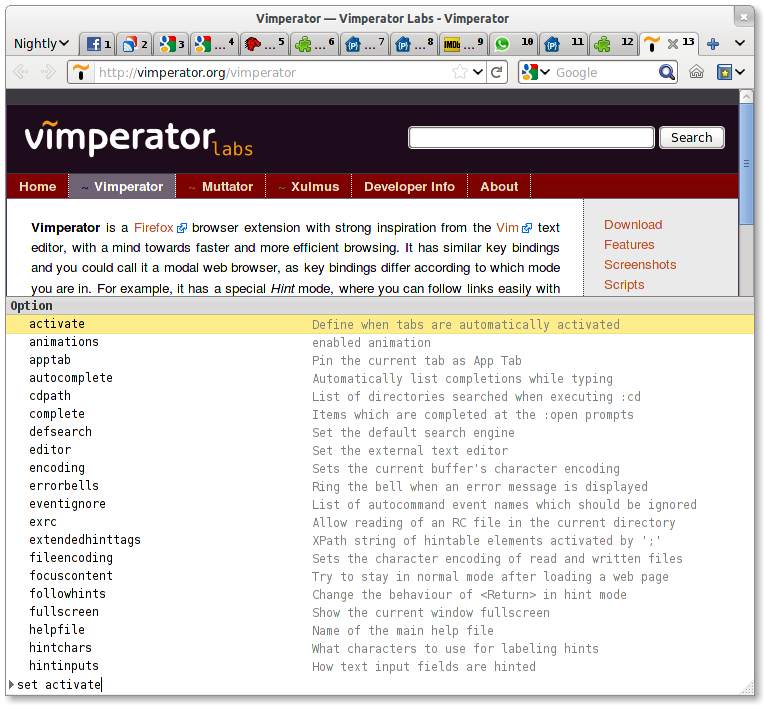 Vimperator, the flagship project from Vimperator labs, creates a Vim-like Firefox. Vimperator is a Firefox browser extension with strong inspiration from the Vim text editor, with a mind towards faster and more efficient browsing. It has similar key bindings and you could call it a modal web browser, as key bindings differ according to which mode you are in. For example, it has a special Hint mode, where you can follow links easily with the keyboard only. Also most functionality is available as commands, typing :back will go back within the current page history, just like hitting the back button in the toolbar. Muttator is to Thunderbird what Vimperator is to Firefox. Combines the best aspects of Vim and Mutt. 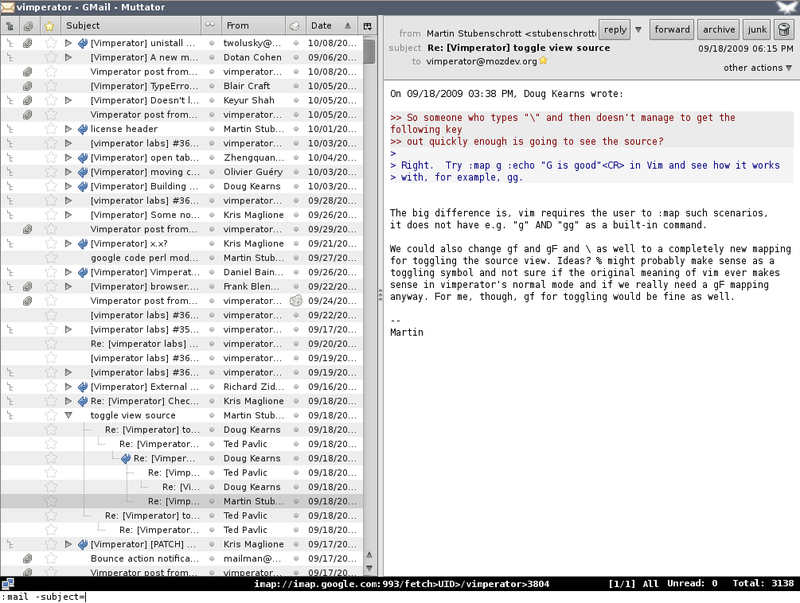 Muttator is a free add-on for the Thunderbird mail client, which makes it look and behave like the Vim text editor. It has similar key bindings and you could call it a modal mail client, as key bindings differ according to which mode you are in. For example, the same keys can select the next message while the message list has focus or can scroll down an existing message when the message preview is selected. It also adds commands for accessing most Thunderbird functionality. E.g., :contact -lastname "Vimperator" vimperator@mozdev.org will add Vimperator’s mailing list to your address book. Vimium is a Google Chrome extension written by Phil Crosby and Ilya Sukhar which provides keyboard shortcuts for navigation and control in the spirit of the Vim editor. Due to limitations of the Chrome extension mechanism, it is not as powerful as Vimperator but is still considered the best Vimperator-like extension for Chrome. Vrapper is an Eclipse plugin which acts as a wrapper for Eclipse text editors to provide a Vim-like input scheme for moving around and editing text. Unlike other plugins which embed Vim in Eclipse, Vrapper imitates the behaviour of Vim while still using whatever editor you have opened in the workbench. The goal is to have the comfort and ease which comes with the different modes, complex commands and count/operator/motion combinations which are the key features behind editing with Vim, while preserving the powerful features of the different Eclipse text editors, like code generation and refactoring. VsVim is a Vim Emulation layer for Visual Studio 2010 and above. It integrates the familiar key binding experience of Vim directly into Visual Studio’s editor. For now, we have just focused on these three Mozilla applications because of time constraints. If you want other host applications like Instantbird or Sunbird to make use of our liberator library, feel free to contact us.